No Doubt is an American rock band from Anaheim, California, formed in 1986. Since 1989, the band has consisted of lead vocalist, Gwen Stefani; bassist, saxophonist, and keyboardist, Tony Kanal; guitarist and keyboardist, Tom Dumont; and drummer, Adrian Young. Since the mid-1990s in live performances and the studio, they have been supported by keyboardist and trombonist, Gabrial McNair; and keyboardist and trumpeter, Stephen Bradley. The ska sound of their song "Trapped in a Box", featured on their 1992 eponymous debut album, failed to make an impact. The Beacon Street Collection was a raw expression of their sound, inspired by ska punk and released independently by the band under their own record label. The album sold over 100,000 copies in 1995, over three times as many as their first album. The band's diamond-certified album Tragic Kingdom (1995) benefited from the resurgence of third-wave ska in the 1990s, and "Don't Speak", the third single from the album, set a record when it spent 16 weeks at the number one spot on the Billboard Hot 100 Airplay chart. The group's next album, Return of Saturn (2000), despite its Top 40 hit single "Simple Kind of Life", did not match the success of their previous album, but received critical praise and was nominated for Best Rock Album at the 43rd Grammy Awards. Fifteen months later, the band reappeared with Rock Steady (2001), which incorporated reggae and dancehall music into their work. The album was primarily recorded in Jamaica and featured collaborations with Jamaican artists Bounty Killer, Sly and Robbie, and Lady Saw. The album produced two Grammy-winning singles, "Hey Baby" and "Underneath It All". "Hella Good" was also nominated for a Grammy award. On November 22, 2002, No Doubt received the Key to the City of Anaheim, given by the Mayor of Anaheim, Tom Daly, in Disneyland during the band's appearance on 'Breakfast with Kevin and Bean' (KROQ-FM) where they performed five songs. After a 2004 tour the band embarked on solo projects, with Stefani releasing two successful solo albums Love. Angel. Music. Baby. (2004) and The Sweet Escape (2006) while Tom Dumont released his own solo music project, Invincible Overlord. In 2008, the band resumed working slowly on their sixth effort, titled Push and Shove (2012), and released their single "Settle Down". They have sold over 33 million records worldwide. Eric Stefani and John Spence met at a Dairy Queen, and talked about getting a group together to play music. Stefani acquired a keyboard and gathered some players together to practice; these included himself (keyboards), Gwen Stefani (backing vocals), John Spence (lead vocals), Jerry McMahon (guitar), Chris Leal (bass), Chris Webb (drums), Gabriel Gonzalez & Alan Meade (trumpet), and Tony Meade (saxophone). They practiced in Eric's parents' garage. Tony Kanal went to one of the band's early shows, and soon joined the band as its bassist. After initially rejecting her advances, he began dating Gwen, but they kept their relationship secret for a year, feeling that it was an unspoken rule that no one in the band date her. Paul Caseley (trombone) also joined the band in 1987. Eric Carpenter (saxophone) joined the horn section soon after. The group performed at an Orange High School backyard graduation party on June 6, 1987 with two other California ska bands. At the party, No Doubt's set included "Total Hate", "Too Much Pressure", "Gangsters", and the song "No Doubt". Video clips from the party have appeared on VH1's Behind the Music. In December 1987, Spence committed suicide several days before the band was to play a gig at The Roxy Theatre for record industry employees. No Doubt disbanded but decided to regroup after several weeks with Alan Meade taking over vocals. When Meade left the band, Gwen replaced him as lead singer, and No Doubt continued to develop a live following in California. In early 1988, Tom Dumont left Rising, a heavy metal band of which he was a member with his sister, stating that local metal bands "were into drinking, wearing Spandex" but that he wanted to focus on music. He joined No Doubt and replaced Jerry McMahon as the band's guitarist. Adrian Young replaced Chris Webb as their drummer the following year. During this time period, No Doubt played gigs at local colleges, Fender's Grand Ballroom, The Whisky, The Roxy, many shows with The Untouchables, Fishbone, and a show with the Red Hot Chili Peppers at Cal State Long Beach. Caseley left No Doubt in July 1989 for the US Navy Band. Impressed by the presence of stage diving fans at No Doubt's concerts and Gwen's on-stage presence, Tony Ferguson signed the band to a multi-album deal with the newly created Interscope Records in 1990. No Doubt's self-titled debut album was finally released in 1992, but it featured no radio singles, although a video was made for "Trapped in a Box". The album's distinctly upbeat pop/cartoon sound sharply contrasted with the then-dominant grunge movement. Owing to the music world's direct focus on grunge, No Doubt's album was not supported by the record label, and was considered a commercial failure for selling only 30,000 copies. The band embarked on a national tour in support of the album, though Interscope refused to support the tour. 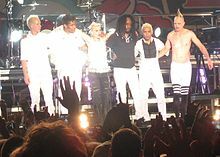 The band failed to bring the audiences that it had attracted in southern California, and often found that No Doubt was not even available in the cities where it was playing. Eric Stefani began to withdraw from the group, vacillating between being in and out of the band. The band began work on its next album the next year, but Interscope rejected much of its material, and the band was paired with producer Matthew Wilder. Eric did not like to relinquish creative control to someone outside the band and eventually stopped recording and rehearsing. He left No Doubt in 1994 to resume an animation career with the cartoon TV series The Simpsons. Kanal then ended his seven-year relationship with Gwen, saying that he needed "space". Unsure of what to do with the band, Interscope sublicensed the project to Trauma Records in 1993. No Doubt released The Beacon Street Collection, consisting of outtakes from its previous recording sessions, that year on its own label, Beacon Street Records. Mixing 1980s punk rock and some grunge influences into the band's sound, the album contains a rawer sound than No Doubt, and it sold more than three times as many copies as its predecessor. Later that year, the label released Tragic Kingdom, much of which dealt with the relationship between Tony Kanal and Gwen Stefani. The release of 1995's Tragic Kingdom and the single "Just a Girl" allowed the group to achieve mainstream commercial success. No Doubt began touring in support of the album late that year, and it grew into a 27-month international tour. In 1996, the second single, "Spiderwebs", was successful, and "Don't Speak", a ballad written by Gwen and Eric Stefani about Gwen and Kanal's break-up, was released as the third single and broke the previous record when it topped the Billboard Hot 100 Airplay for sixteen weeks. No Doubt was nominated for two Grammy Awards for Best New Artist and Best Rock Album at the 1997 Grammy Awards. By the end of the year, half of the songs on Tragic Kingdom had been released as singles, and the album was certified eight times platinum. Later, they were nominated for two more Grammys for Song of the Year and Best Pop Performance by a Duo or Group with Vocal, both for "Don't Speak". The Recording Industry Association of America certified the album diamond in February 1999, and with worldwide sales of sixteen million, it is one of the best-selling albums in history. Through the success of Tragic Kingdom, the band's self-titled debut album began again to sell copies, and reached total sales of over a quarter of a million copies. Arguably the band's most famous song. The lead single from Return of Saturn, produced with Talking Heads member Jerry Harrison. The band finished its tour in December 1997 and had several releases during the two-year writing process to make its follow-up to Tragic Kingdom. Live in the Tragic Kingdom, a live long-form video of the band's performance at the Arrowhead Pond of Anaheim, was released and The Beacon Street Collection was re-released while the band was on tour that year. The band recorded "I Throw My Toys Around" with Elvis Costello for The Rugrats Movie, and it contributed to The Clash's tribute album Burning London: The Clash Tribute. Stefani began to make recordings without the band, contributing vocals to tracks for The Brian Setzer Orchestra, Prince, Fishbone & Familyhood Nextperience, and her boyfriend Gavin Rossdale's band Bush. After some time in-between albums, No Doubt included its song "New" on the soundtrack to the movie Go in 1999. "New", inspired by Gwen's budding relationship with Rossdale, was one of the first songs written after the release of Tragic Kingdom. In 2000, the band released Return of Saturn, its follow-up to Tragic Kingdom. The album featured a darker tone and was more lyrically advanced than No Doubt's previous work. The main lyrical focus of the new record had shifted from Gwen Stefani's relationship with bassist Tony Kanal to her new relationship with Gavin Rossdale. Return of Saturn was critically acclaimed, but was not as commercially successful as their previous album, and the lead single, "Ex-Girlfriend", failed to chart on the Billboard Hot 100 in the United States. Also released as singles from the album were the tracks "Simple Kind of Life" and "Bathwater". Lukewarm sales drastically shortened the tour that followed, appearing only in festival settings in L.A., Cincinnati, Nashville, Jacksonville and Miami. On August 10, No Doubt went on VH1 Storytellers and performed a few of their songs, and were joined by friend Alain Johannes (of Eleven) and former member Eric Stefani. The band's second highest charting U.S. single, produced with Sly & Robbie in Jamaica and featuring Lady Saw. 2003 was a big year of releases for No Doubt. The album The Singles 1992–2003, a compilation of the band's commercially released singles, was released on November 25, 2003. It included a cover of the song "It's My Life", which had originally been a hit for synthpop group Talk Talk in 1984, and earned No Doubt a Grammy nomination for Pop Performance by a Duo or Group With Vocal. Additionally, a special 2-CD 2-DVD box set titled Boom Box was made available, which included the CDs The Singles 1992–2003 and Everything in Time and the DVDs The Videos 1992–2003 and Live in the Tragic Kingdom. Separately, Rock Steady Live, a DVD of the band performing in Long Beach from their Rock Steady tour was released in 2003 as well. The next year, the band was featured in a re-recording of the Toots and the Maytals classic song "Monkey Man". The band also toured with Blink-182 in mid-2004, before embarking on a hiatus. Lead singer Gwen Stefani began work on her 1980s-inspired new wave and dance-pop side project in 2003, which eventually evolved into the full-fledged solo album Love. Angel. Music. Baby., released on November 23, 2004. The album reached multi-platinum status in several countries, including a quintuple platinum certification in Canada and triple platinum in the US. No Doubt was featured on the album True Love by Toots and the Maytals, which won the Grammy Award in 2004 for Best Reggae Album, and showcased many notable musicians including Willie Nelson, Eric Clapton, Jeff Beck, Trey Anastasio, Ben Harper, Bonnie Raitt, Manu Chao, The Roots, Ryan Adams, Keith Richards, Toots Hibbert, Paul Douglas, Jackie Jackson, Ken Boothe, and The Skatalites. Stefani launched her first solo arena tour in October 2005, which coincided with the news of her pregnancy (her son, Kingston James McGregor Rossdale, was born on May 26, 2006). She released her second solo dance-pop album, The Sweet Escape in December 2006. In 2008, Tony Kanal collaborated with pop rock artist Pink on the album Funhouse. Kanal co-produced "Sober", co-wrote "Funhouse" and also sang back-up vocals on "Crystal Ball". With Stefani promoting her second solo album, No Doubt began initial work on a new album without her and planned to complete it after Stefani's tour was finished. However songwriting was slow as Gwen Stefani was, at the time, pregnant with her second child. The album was produced by Mark "Spike" Stent, who helped produce and mix Rock Steady. No Doubt announced on their official website that they would tour in the summer of 2009 with Paramore, The Sounds, Janelle Monáe, Bedouin Soundclash, Katy Perry, Panic! at the Disco, and Matt Costa, all while finishing their upcoming album, which was set for release in 2010. As a special promotion for the tour, the band was giving away their entire music catalog free as a digital download with purchase of top tier seating. The band released another compilation album on November 2 called Icon, in preparation for their upcoming comeback album. Icon featured the same track listing as their previous compilation album The Singles 1992–2003 albeit with new artwork and a low price point. On June 11, 2012, the band announced on their official website that the new album would be out on September 25, preceded by the first single in July 16. The album was titled Push and Shove and the first single was a song called "Settle Down". The music video for "Settle Down" was directed by Sophie Muller (who has previously directed numerous music videos for No Doubt). "Settle Down" peaked at #34 on the Billboard Hot 100 with the album peaking at #3. On November 3, 2012, the band pulled its music video "Looking Hot" from the Internet after receiving complaints that it was insensitive towards Native Americans. As of February 1, 2013, the band stated via Twitter that they had "Finished a week of songwriting", implying that they have more new tracks written. As of February 26, 2013, the band officially confirmed through their website that they had indeed begun working on new music as well as plans for an upcoming tour. In October 2013 Tom revealed on social networking site Twitter that the band was once again on hiatus, also hinting that the band will regroup in 2014. No Doubt performed at the Global Citizen Festival in Central Park on September 27, 2014. They also announced via Twitter that they would perform at Rock in Rio USA in May 2015. With the release of Gwen Stefani's solo single "Baby Don't Lie", she announced that No Doubt were working on a new album. However, during an interview with the Orange County Register in April 2015, Tony Kanal stated that the band was not working on any new material. No Doubt performed at several events during 2015, including Global Citizen Earth Day Concert, Rock In Rio USA, and was expected to perform at Jazz Aspen Snowmass, in Colorado, Riot Fest and Carnival in Chicago, and Kaaboo in Del Mar, Calif. In a June 2016 interview with Rolling Stone, Stefani expressed uncertainty over the future of No Doubt. "I don't know what's going to happen with No Doubt. When Tony [Kanal] and I are connected creatively, it's magic. But I think we've grown apart as far as what kind of music we want to make. I was really drained and burned out when we recorded that album [2012's Push and Shove]. And I had a lot of guilt: 'I have to do it.' That's not the right setting to make music. There's some really great writing on that record. But the production felt really conflicted. It was sad how we all waited that long to put something out and it didn't get heard." No Doubt's musical style have been characterized as ska punk, reggae fusion, punk rock, pop punk, new wave, alternative rock and pop rock. The band's debut album blended the ska punk, alternative rock and new wave genres. However, the band utilised a punk rock sound in their second album The Beacon Street Collection and their third album Tragic Kingdom, although the latter incorporated pop punk and alternative rock influences. They later shed their punk rock roots for the following album Return of Saturn, utilising influences from new wave music and pop rock. The band completely altered their sound in their next album Rock Steady, incorporating Jamaican music influences from reggae fusion, rocksteady and dance-rock. However the band's comeback album Push and Shove blended pop rock, new wave music and dancehall. In 2009, No Doubt made an appearance on the television series Gossip Girl, playing a fictional band called "Snowed Out" in the episode "Valley Girls". They performed a cover version of the Adam and the Ants song "Stand and Deliver". No Doubt played at the Bridge School Benefit organized by Neil Young on October 24 and 25, 2009, at the Shoreline Amphitheatre in Mountain View, California. On December 5, 2010, No Doubt performed a tribute to Paul McCartney at The Kennedy Center Honors, playing a medley of Beatles hits including "Hello, Goodbye", "All My Loving", and "Penny Lane". The band performed for President Barack Obama, Sir Paul McCartney, and Oprah Winfrey. The band also appeared as guests in the animated show King of the Hill and the sketch comedy program Portlandia. They can also be seen in a scene of the Simpsons episode "Homerpalooza". At the time Eric Stefani was one of the show's animators, and inserted his sister and her bandmates behind Homer in the scene where the crowd riots against him. On November 4, 2009, the Los Angeles Times reported that No Doubt had filed a lawsuit over its portrayal in the music video game Band Hero. The lawsuit alleged that the game had "transformed No Doubt band members into a virtual karaoke circus act", singing dozens of songs the group neither wrote, popularized, nor approved for use in the game. The case was filed in Los Angeles Superior Court and cited Activision, the game's distributor, as having exceeded contractual likenesses of the members of No Doubt. On February 15, 2011, the California Court of Appeal for the Second Appellate District affirmed the trial court's denial of Activision's special motion to strike No Doubt's lawsuit as a strategic lawsuit against public participation, after an interlocutory appeal by Activision. The appellate court explained that the dispute arose from No Doubt's discovery, two weeks before Band Hero went on sale, that its band members could be manipulated in the game to perform songs they would never perform in real life. The court then explained: "The band also learned that female lead singer Gwen Stefani's avatar could be made to sing in a male voice, and the male band members' avatars could be manipulated to sing songs in female voices. The individual band member avatars could be made to perform solo, without their band members, as well as with members of other groups." The court then ruled that Activision's First Amendment defense was meritless, No Doubt had a reasonable probability of prevailing on the merits, and that No Doubt was entitled to recover costs and attorney's fees incurred in opposing Activision's appeal. ^ a b "No Doubt | New Music And Songs". MTV. Archived from the original on 2012-05-12. Retrieved 2014-04-11. ^ "News : No Doubt To Receive Key To The City Of Anaheim". No Doubt. Retrieved 2011-07-07. ^ a b c d e f g h i "No Doubt". Behind the Music. VH1. April 9, 2000. ^ a b c Vineyard, Jennifer (February 26, 1998). "Tunes and 'Toons". OC Weekly. Village Voice Media. Archived from the original on December 17, 2013. Retrieved April 17, 2014. ^ a b c ""Timeline". NoDoubt.com. Retrieved August 24, 2007". Nodoubt.com. Archived from the original on February 23, 2009. Retrieved 2010-01-01. ^ Heath, Chris. "Snap! Crackle! Pop!". Rolling Stone, issue 759. May 1, 1997. ^ a b "No Doubt". Rock On The Net. Retrieved 2017-07-27. ^ Sullivan, Caroline (February 15, 2002). "'We'll make one more album, then I'll get pregnant'". The Guardian. London. Retrieved August 22, 2011. ^ "Diamond Awards". Recording Industry Association of America. Archived from the original on July 1, 2007. Retrieved August 24, 2007. ^ "No Doubt In Middle Of Legal Battle". MTV. 1997-05-28. Retrieved 2017-07-27. ^ "No Doubt". No Doubt. Archived from the original on February 23, 2009. Retrieved 2011-10-31. ^ "Grammy Awards 2005: Key winners". bbc.co.uk. 14 February 2005. ^ "Gold & Platinum Certification". CRIA. 2006. Retrieved January 3, 2006. ^ "Linear CD Notes". Tootsandthemaytals.net. 2014-06-20. Archived from the original on 2016-11-10. Retrieved 2017-07-27. ^ "For The Record: Quick News On Britney Spears, Green Day, Avril Lavigne, Jennifer Lopez, A Perfect Circle & More". MTV. 2004-06-30. Retrieved 2017-07-27. ^ "For The Record: Quick News On Mariah, Kid Rock, 'Fantastic Four,' Ne-Yo, Chris Brown, Will.I.Am & More". MTV. 2006-12-22. Retrieved 2017-07-27. ^ ""new album". NoDoubt.com. 2008. Retrieved March 30, 2008". Forums.nodoubt.com. 2008-03-28. Archived from the original on 2008-04-01. Retrieved 2010-01-01. ^ ""2009 Tour". NoDoubt.com. 2008. Retrieved November 22, 2008". Nodoubt.com. Retrieved 2011-10-31. ^ "News : No Doubt Announces 2009 Summer Tour". No Doubt. Retrieved 2010-01-01. ^ "News : Receive No Doubt's Entire Digital Catalog For Free With Online Ticket Purchase". No Doubt. Retrieved 2010-01-01. ^ "No Doubt : News : New Releases in 2010 and 2011". Interscope.com. 2010-09-13. Retrieved 2011-10-31. ^ "Album and Single Announcement!" Archived June 15, 2012, at the Wayback Machine. Nodoubt.com. 2012-06-11. Retrieved 2012-06-12. ^ "No Doubt announce new album Push And Shove". Rekwired. 2012-06-13. Retrieved 2012-06-13. ^ Toney, Veronica (2012-11-05). "No Doubt apologizes, pulls 'Looking Hot' video - Celebritology 2.0". The Washington Post. Retrieved 2012-12-20. ^ "Twitter / nodoubt: . @gwenstefani @TonyKanal". Twitter.com. 2013-02-01. Retrieved 2014-04-11. ^ "Greetings From the Studio!". NoDoubt.com. February 26, 2013. ^ "Twitter / TomDumontND: @JoohnUK Hey John, we're on". Twitter.com. 2013-11-04. Retrieved 2014-04-11. ^ "Listen: Gwen Stefani unveils brand new single 'Baby Don't Lie'". Gigwise.com. Retrieved 2017-07-27. ^ "No Doubt plans a family affair in the desert". Ocregister.com. Retrieved 2017-07-27. ^ Billboard (2015-04-18). "Usher, No Doubt, Fall Out Boy Highlight Inaugural Global Citizen Earth Day Concert In DC". Billboard. Retrieved 2017-07-27. ^ "» No Doubt, Metallica, Help Save The Day for Rock In Rio USA". California Rocker. Retrieved 2017-07-27. ^ "Tour". Nodoubt.com. Retrieved 2017-07-27. ^ Hiatt, Brian (2016-06-17). "Gwen Stefani on No Doubt's Future, Working With Prince". Rolling Stone. Retrieved 2017-07-27. ^ "News : Gossip Girl Appearance Announced!". No Doubt. 2009-02-26. Archived from the original on 2011-07-14. Retrieved 2010-01-01. ^ Vena, Jocelyn (2009-03-17). "No Doubt Say They 'All Agreed' On 'Gossip Girl' Song — News Story | Music, Celebrity, Artist News | MTV News". Mtv.com. Retrieved 2010-01-01. ^ Matthew Perpetua (2010-12-29). "Video: No Doubt Pay Tribute to Paul McCartney at Kennedy Center Honors". Rollingstone.com. Retrieved 2011-10-31. ^ "No Doubt sues Activision over Band Hero". Los Angeles Times. 2009-11-04. Retrieved 2010-01-01. ^ No Doubt v. Activision Publishing, Inc., 192 Cal. App. 4th 1018 (2011). Wikimedia Commons has media related to No Doubt.